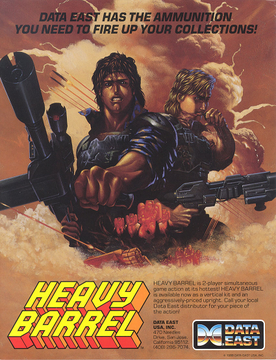 Heavy Barrel - FLYING TIGER ENTERTAINMENT, INC. 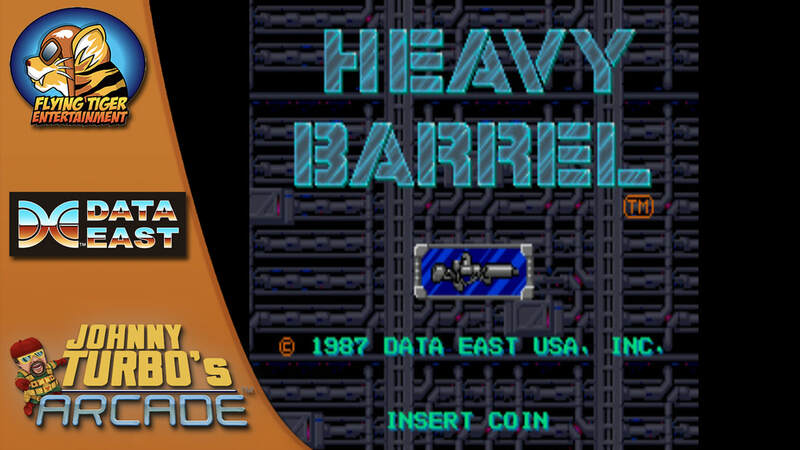 Flying Tiger’s Johnny Turbo’s arcade releases the 1990’s arcade classic, Heavy Barrel for Nintendo Switch Now! Los Angeles, CA - October 5th, 2018 – Flying Tiger Entertainment presents the Japanese arcade hit, Heavy Barrel, the next action game release from Johnny Turbo’s Arcade, featuring classics by Data East™. Launching on November 15, 2018 for $7.99 in America, Available December 27, 2018 in selected European territories. Terrorists have seized the underground control complex of a nuclear missile site, and it is up to the player to infiltrate the base and kill the enemy leader. Players begin armed with a gun with unlimited ammunition and a limited supply of grenades. Improved weapons and grenade power-ups are made available within the game, either in plain sight or within crates that must be unlocked using keys. Additionally, crates may contain orbs or one of the six pieces of the Heavy Barrel superweapon. Like SNK's Ikari Warriors, the original arcade version featured 8-way rotary joysticks. The name of the game is from an in-game weapon. The Heavy Barrel is found in six pieces and is an energy cannon capable of destroying any enemy in the game with a single shot (except the final enemy, and possibly one other boss that may have required two shots). The weapon has a wide arc of fire and can be fired as fast as the player's trigger finger permits, but after thirty seconds its use is exhausted, at which point the bearer reverts to his previous weaponry. The Heavy Barrel is best used to get past tough bosses, and the game only contains enough pieces to allow the weapon to be built three times in a single game. In a two-player game, whoever collects the sixth piece is equipped with the Heavy Barrel.